Amongst the many anniversaries that will be celebrated in 1989, there is one that the media and historians will not talk about other than briefly and then only with the conscious aim of distorting its significance. In March 1919 the founding Congress of the Communist International was held. As they did with the bicentenary of the foundation of the United States, the bourgeoisie's well-paid historians will celebrate the bicentenary of the French Revolution of 1789 by trumpeting the values of liberty, equality, fraternity, democracy and the nation as the absolute and definitive principles that had at last been discovered to lead human­ity to ‘happiness'. Two centuries of exploita­tion, class struggle, misery and imperialist war, have revealed the capitalist reality behind these fine words. For the bourgeoisie, the purpose of these celebrations is to make people forget that "capitalism was born in blood and filth" (Marx), that it was born of the class struggle, and above all, that it is a transitory social form, which will disappear as all the previous modes of production have done before it. The anniversary of the foundation of the Communist International is there to remind the bourgeoisie of 1989 that the class struggle is a reality of today's crisis-ridden capitalism, that the proletariat exists as both an exploited and a revolutionary class; it heralds the end of the bourgeoisie itself. "The whole of Europe is filled with the spirit of revolution. There is a deep sense not only of discontent, but of anger and revolt amongst the workmen against pre-war conditions. The whole existing order in its political, social and economic aspects is questioned by the masses of the population from one end of Europe to the other" (quoted in Carr, The Bolshevik Revolution, Vol 3, p .13 5 ). We know today that the CI's foundation was the high point of the revolutionary wave which extended from 1917 until at least 1923, through­out the world, from Europe to Asia (China), and to the ‘new' world from Canada (Winnipeg) and the USA (Seattle) to Latin America. This revo­lutionary wave was the international prole­tariat's answer to World War I, to 4 years of imperialist war amongst the capitalist states to divide the world up between them. The attitude towards the imperialist war of the different parties and individual militants of the social ­democracy, the 2nd International swallowed up by the war in 1914, was to determine what at­titude they would adopt faced with the revolu­tion and the Communist International. "The Communist International was formed af­ter the conclusion of the imperialist war of 1914-18 in which the imperialist bourgeoisie of the different countries sacrificed 20 million men. In the Communist Manifesto of 1848, Karl Marx set out one of the essential principles of the proletariat's struggle against capitalism: "The workers have no country". This principle did not mean that workers should take no interest in the national question, but on the contrary that they should define their positions and attitudes on the subject, and on the question of national wars, as a function of their own historical struggle. The question of war and the attitude of the proletariat were always at the centre of the debates of the 1st International (1864-73), as it was in those of the 2nd (1889-1914). During most of the 19th century, the ­proletariat could not remain indifferent to the wars of national emancipation against feudal and monarchic reaction, and especially against Russian tsarism. "I have asked to speak in the name of the Russian and Polish delegations to remind you that on this point [the mass strike in Russia and the war, ed.) we must draw the lesson of the great Russian revolution [ie of 1905, ed.] ... The Russian revolution did not only arise as a result of the war; it also put an end to the war; without it, Tsarism would undoubtedly have continued the war" (Rosa Luxemburg, quoted in BD Wolfe, Lenin, Trotsky, Stalin). "Should a war break out nonetheless, the so­cialists have the duty to work to bring it to an end as rapidly as possible, and to use by every means the economic and political crisis provoked by the war to awaken the people and so to hasten the downfall of capitalist domina­tion" (quoted in the Resolution on the Socialist currents and the Berne conference, at the First Congress of the CI). "Let the bourgeois governments not forget that the Franco-Prussian war gave birth to the revolutionary insurrection of the Commune, and that the Russo-Japanese war set in motion the revolutionary forces in Russia. In the eyes of the proletarians, it is criminal to massacre them­selves for the benefit of capitalist profit, dy­nastic rivalry, and the flourishing of diplomatic treaties" (ibid). The 4th August 1914 marked the outbreak of the First World War. Riddled with opportunism, swept away in the flood of chauvinism and war fever, the 2nd International broke up and died in shame: its principal parties (above all the French and German social-democratic parties and the British Labor party, in the hands of the opportunists), voted for war credits, called for the ‘defense of the fatherland', and a ‘holy alliance' with the bourgeoisie against ‘foreign invasion'; in France, they were even rewarded with ministerial positions for having given up the class struggle. They received a theoretical support from the ‘centre' (ie between the International's left and right wings), when Kautsky, who had been called the ‘pope of marxism', distinguished between war and the class struggle, declaring the latter possible only ‘in peacetime' .... and so of course impossible ‘for the duration'. Only a few parties stood up to the storm: es­sentially the Italian, Serbian, Bulgarian and Russian parties. Elsewhere, isolated militants or groups, usually from the Left, such as Rosa Luxemburg and the Dutch ‘Tribunists' around Gorter and Pannekoek, remained faithful to proletarian internationalism and the class struggle and tried to regroup. In September 1915, the ‘International Socialist Conference of Zimmerwald' was held. It was to be followed in April 1916 by a second confer­ence at Kienthal, also in Switzerland. Despite the difficult conditions of war and repression, delegates from 11 countries took part, including Germany, Italy, Russia and France. Zimmerwald recognised the war as imperialist. The majority of the conference refused to de­nounce the opportunist right of the social-demo­cratic parties which had gone over to the camp of the ‘holy alliance', or to envisage splitting with them. This centrist majority was pacifist, defending the slogan of ‘peace'. United behind the representatives of the Bolshevik fraction, Lenin and Zinoviev, the ‘Zimmerwald Left', defended the necessity of a split, and the construction of the 3rd International. Against pacifism, they declared that "the struggle for peace without revolution­ary action is a hollow and deceitful phrase" (Lenin), and opposed centrism with the slogan of "transformation of the imperialist war into a civil war. This slogan, precisely, is indicated in the resolutions of Stuttgart and Basel" (Lenin). "The second Zimmerwald Conference (Kienthal) is undoubtedly a step forward. ( ... ) What then should we do tomorrow? Tomorrow, we must continue the struggle for our solution, for the revolutionary social-democracy, for the 3rd International! Zimmerweld and Kienthal have shown that our road is the right one" (Zinoviev, 10/6/1916). The meeting between the lefts of different countries, and their common combat, made possi­ble the constitution of the "first nucleus of the 3rd International in formation", as Zinoviev recognized in March 1918. The 1917 proletarian revolution in Russia opened a revolutionary wave throughout Europe. The proletarian threat decided the international bourgeoisie to bring the imperialist carnage to an end. Lenin's slogan became a reality: the Russian, then the international proletariat transformed the imperialist war into a civil war. Thus the proletariat honored the Left of the 2nd International, by applying the famous Stuttgart resolution. The war had definitively thrust the oppor­tunist right of the social-democratic parties into the camp of the bourgeoisie. The revolutionary wave put the pacifists of the centre up against the wall, and was to thrust many of them in their turn, especially the leaders such as Kautsky into the bourgeois camp. The International no longer existed. The new par­ties formed by splits from the social-democracy began to adopt the name of ‘Communist Party'. The revolutionary wave encouraged and de­manded the constitution of the world party of the proletariat: the 3rd International. 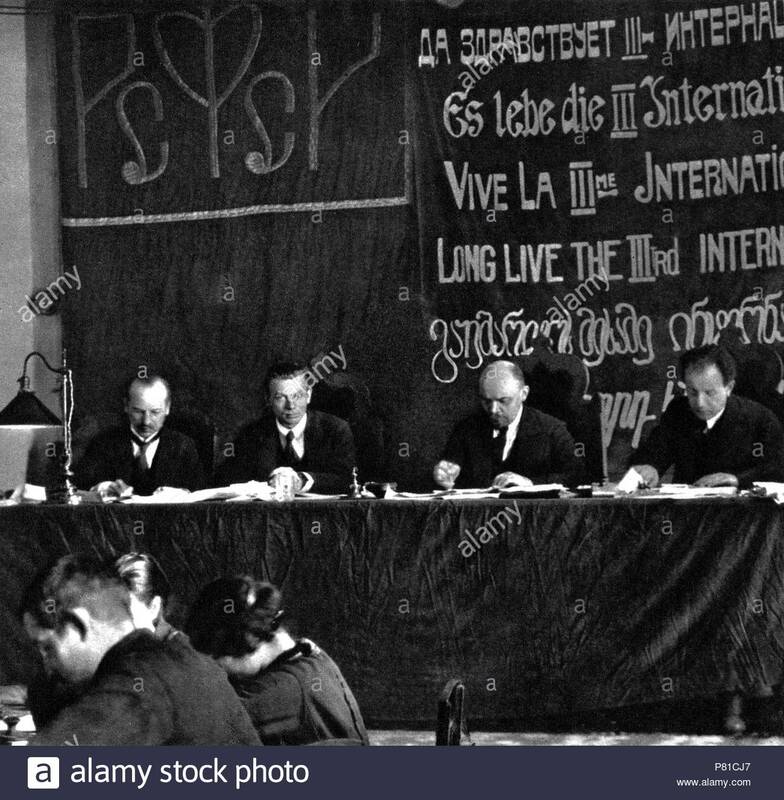 The new International, which adopted the name of the Communist International, was thus formed in March 1919 on the basis of an organic split with the right wing of the parties of the defunct 2nd International. It did not, however, reject its principles or its contributions. "Sweeping aside the half-heartedness, lies and corruption of the outlived official Socialist parties, we Communists, united in the 3rd International, consider ourselves the direct con­tinuators of the heroic endeavors and martyr­dom of a long line of revolutionary generations from Babeuf to Karl Liebknecht and Rosa Luxemburg. The currents, the fractions, the traditions and the positions which formed the basis of the CI, were developed and defended by the Left within the 2nd International. "Experience proves that only in a regroup­ment selected from the historical milieu - the 2nd International - in which the pre-war prole­tariat developed could the proletarian struggle against the imperialist war be pushed to its ex­treme conclusion, for only this group was able to formulate and advanced program for the proletarian revolution, and so to lay the foundations for a new proletarian movement" (Bilan, theoretical bulletin of the Italian Fraction of the Communist Left), no. 34, August 1936, p.1128). "The conferences of Zimmerweld and Kienthal were important at a time when it was necessary to unite all those proletarian elements deter­mined in one way or another to protest against the imperialist butchery. ( ... ) The Zimmerwald group has had its day. All that was truly revolutionary in the Zimmerwald goes over to and joins the Communist International" (Declaration of the Participants at Zimmerwald, quoted in Broue, op. cit.). We insist strongly on the continuity between the two Internationals. As we have seen on the organic level, the CI did not appear out of the blue. The same is true of its program and its political principles. Not to recognize the historical link between the two means succumb­ing to an anarchist inability to understand how history works, or to a mechanistic spontaneism which sees the CI as solely the product of the revolutionary movement of the working masses. Without recognizing this continuity, it is im­possible to understand why and how the CI breaks with the 2nd International. For although there is a continuity between the two, expressed amongst other things in the Stuttgart resolu­tion, there is also a rupture. A rupture concretized in the CI's political program, in its political positions and in its organizational and militant practice as the ‘world communist party'. A rupture in facts, by the use of armed and bloody repression: against the proletariat and the Bolsheviks in Russia by the Kerensky gov­ernment, with the participation of the Mensheviks and the SRs, both members of the 2nd International; against the proletariat and the KPD in Germany by the Social-Democratic government of Noske-Scheidemann. Without recognizing this ‘break within a con­tinuity', it is also impossible to understand the degeneration of the CI during the 1920s and the combat conducted within it, then outside it during the 30s following their exclusion, by the fractions of the ‘Italian', ‘German' and ‘Dutch' Communist Lefts, to name only the most impor­tant. Today's communist groups and the posi­tions they defend are the product of these left fractions, of their defense of communist princi­ples and their work in carrying out a critical reappraisal of the CI and the 1917-23 revolutionary wave. Without recognizing the heritage of the 2nd International, which is the political heritage of the proletariat, it is impossible to understand the foundations of the CI's posi­tions, nor the validity of some of the most im­portant of them today, nor the contributions of the fractions during the 1930s. In other words, it means being incapable of defending revolutionary positions today, consistently and with assurance and determination. In fact, the Spartakusbund no longer existed since the foundation of the German Communist Party (Kommunistische Partei Deutschlands) on 29th December 1918. The KPD had just lost its two principal leaders, Rosa Luxemburg and Karl Liebknecht, assassinated by the social-democ­racy during the terrible repression of the Berlin proletariat in January. Thus at the very moment of its foundation, the CI suffered, along with the international proletariat, its first de­feat. Two months before it was constituted, the CI lost two leaders whose prestige, strength, and theoretical abilities were comparable to those of Lenin and Trotsky. It was Rosa Luxemburg who had the most developed, in her writings at the end of the previous century, the point that was to become the keystone of the 3rd International's political program. "Matters have reached such a pitch that to­day mankind is faced with two alternatives: it may perish amid chaos; or it may find salvation in socialism" (Speech on the Program, Merlin Press). "1. The present epoch is the epoch of the collapse and disintegration of the entire capi­talist world system, which will drag the whole of European civilization down with it if capitalism with its insoluble contradictions is not de­stroyed" (Letter of Invitation, in Degras, opcit). "A new epoch is born! The epoch of the dissolution of capitalism, of its inner disintegration. The epoch of the communist revolution of the proletariat" (Platform of the CI, ibid). "One thing is certain, the World War is a turning point for the world. ( ... ) The conditions of our struggle, and we ourselves, have been radically altered by the World War" (Luxemburg, The Crisis in the Social Democracy, 1915). "The basic methods of struggle are mass ac­tions of the proletariat right up to open armed conflict with the political power of capital" (Letter of Invitation in Degras, opcit). The action of the working masses leads to con­frontation with the bourgeois state. The CI's most precious contribution is on the revolution­ary proletariat's attitude to the state. Breaking with the social-democracy's ‘reformism', renew­ing the marxist method and the lessons of the historical experiences of the Paris Commune, Russia 1905, and above all the insurrection of October 1917 with the destruction of the capi­talist state in Russia and the exercise of power by the workers' councils, the CI declared itself clearly and without any ambiguity for the de­struction of the bourgeois state and the dicta­torship of the proletariat, the dictatorship of the working masses organized in the workers' councils. "2. The task of the proletariat is now to seize power immediately. The seizure of state power means the destruction of the state appa­ratus of the bourgeoisie and the organization of a new proletarian apparatus of power. 3. This new apparatus of power should em­body the dictatorship of the working class, and in some places also of the rural semi-proletariat, the village poor ( ... ) Its concrete form is given in the regime of the Soviets or of similar or­gans. 4. The dictatorship of the proletariat must be the lever for the immediate expropriation of capital and for the abolition of private property in the means of production and their transfor­mation into national property" (ibid). This question was an essential one for the Congress, which was to adopt the ‘Theses on bourgeois democracy and proletarian dictator­ship' presented by Lenin. The Theses begin by denouncing the false oppo­sition between democracy and dictatorship. "For in no civilized capitalist country is there ‘democracy in the abstract', there is only bour­geois democracy" (ibid). The Paris Commune had demonstrated the dictatorial character of bourgeois democracy. In capitalism, defending ‘pure' democracy in fact means defending bour­geois democracy, which is the form par excellence of the dictatorship of capital. What free­dom of meeting or of the press is there for workers? "‘Freedom of the press' is another leading watchword of ‘pure democracy'. But the workers know..., that this freedom is deceptive so long as the best printing works and the biggest pa­per supplies are in capitalist hands, and so long as capital retains its power over the press, a power which throughout the world is expressed more clearly, sharply, and cynically, the more developed the democracy and the republican regime, as for example in America. To win real equality and real democracy for the working masses, for the workers and peasants, the cap­italists must first be deprived of the possibility of getting writers in their service, of buying up publishing houses and bribing newspapers. And for that it is necessary to throw off the yoke of capital, to overthrow the exploiters and to crush their resistance" (Theses, ibid). After the experience of the war and the rev­olution, to demand and defend pure democracy, as do the Kautskyists, is a crime against the proletariat, the Theses continue. In the inter­ests of the different imperialisms, of a minority of capitalists, millions of men were massacred in the trenches, and the ‘military dictatorship of the bourgeoisie' has been set up in every country, democratic or not. Bourgeois democ­racy assassinated Karl Liebknecht and Rosa Luxemburg once they had been arrested and imprisoned by a social-democratic government. And in fact the forms taken by the dictator­ship of the proletariat, which have already been worked out, that is, the Soviet power in Russia, the workers' councils in Germany, the shop stewards' committees, and other analogues of Soviet institutions in other countries, all these make a reality of democratic rights and privi­leges for the working classes, that is for the overwhelming majority of the population; they mean that it becomes really possible to use these rights and privileges in a way and on a scale that was never even approximately possi­ble in the best democratic bourgeois republic" (ibid). Only the dictatorship of the proletariat on a world scale can destroy capitalism, abolish classes, and ensure the passage to communism. "The abolition of state power is the goal of all socialists, including and above all Marx. Unless this goal is reached, true democracy, that is, equality and freedom, is not attainable. But only Soviet and proletarian democracy leads in fact to this goal, for it begins at once to prepare for the complete withering away of any kind of state by drawing the mass organizations of the working people into constant and unre­stricted participation in state administration" (ibid). The question of the state was a crucial one, at a moment when the revolutionary wave was unfurling in Europe and the bourgeoisie in all countries was waging civil war against the pro­letariat in Russia, when the antagonism between capital and labor, between bourgeoisie and proletariat, had reached its most extreme and most dramatic point. The need to defend the dictatorship of the proletariat in Russia and the extension of the revolution, ie the power of the Soviets, internationally to Europe was posed concretely for revolutionaries. For or against the state of the proletarian dictatorship in Russia and the revolutionary wave. ‘For' meant joining the Communist International, and breaking organically and politically with the social-democracy. ‘Against' meant defending the bour­geois state, and choosing definitively the camp of the counter-revolution. For the centrist currents that hesitated between the two, it meant break-up and disappearance. Revolutionary periods do not leave any room for the timid policies of the ‘middle ground'. The change in period revealed definitively by the 1914-18 war determines the break between the political positions of the 2nd and 3rd Internationals. We have seen this on the ques­tion of the state. Capitalism's decline and its consequences for the proletariat's conditions of life and struggle posed a whole series of new problems: was it still possible to take part in elections and make use of parliament? With the appearance of the workers' councils, were the trade unions that had taken part in the ‘holy alliance' with the capitalists still working class organizations? What attitude should be adopted towards national liberation struggles in the epoch of imperialist wars? The CI was unable to answer these new questions? It was formed more than a year af­ter October 1917, two months after the prole­tariat's first defeat in Berlin. The years that followed were marked by the defeat and ebb of the international revolutionary wave, and so by the growing isolation of the proletariat in Russia. This isolation was the determining rea­son behind the degeneration of the state of the proletarian dictatorship. These events left the CI incapable of resisting the development of op­portunism. In its turn, it died. To draw up a balance sheet of the CI, obvi­ously we must recognize it as the International Communist Party that it was. For those who see it only as a bourgeois organization, because of its eventual degeneration, it is impossible to draw up a balance sheet, or to extract any lessons from its experience. Trotskyism lays claim uncritically to the first 4 Congresses. It never saw that where the 1st Congress broke with the 2nd International, the following con­gresses marked a retreat: in opposition to the split with the social-democracy accomplished by the 1st Congress, the 3rd proposed to make an alliance with it in the ‘United Front'. After having recognized its definitive passage into the bourgeois camp, the CI rehabilitated social-democracy at the 3rd Congress. This policy of alliance with the social-democratic parties was to lead Trotskyism in the 1930s to adopt the pol­icy of ‘entrism', ie entering these same parties in direct defiance of the very principles of the 1st Congress. This policy of alliance, or of capitulation as Lenin would have said, was to precipitate the Trotskyist current into the counter-revolution, with its support for the bourgeois republican government in the Spanish civil war and then its participation in the impe­rialist Second World War, in betrayal of Zimmerwald and the International. Already in the 1920s, a new left was created within the CI to try to struggle against this degeneration: in particular, the Italian, Dutch, and German Lefts. These left fractions, which were excluded during the 1920s, continued their political combat to ensure the continuity be­tween the dying CI and the ‘party of tomorrow', by subjecting the CI and the revolutionary wave to a critical reappraisal. It is not for nothing that the review of the Italian Fraction of the Communist Left during the 1930s was called Bilan (‘the balance sheet'). In continuity with the International's princi­ples, these groups criticized the weaknesses in its break with the 2nd International. Their un­sung efforts, in the deepest night of the counter-revolution during the 1930s and the second imperialist war, have made possible the resurgence and existence of communist groups today which, while they have no organic conti­nuity with the CI, ensure its political continuity. The positions worked out and defended by these groups answer the problems raised within the CI by the new period of capitalist decadence. It is therefore on the basis of the critical reappraisal carried out by the ‘Fractions of the Communist Left' that the CI lives today, and will live in the World Communist Party of tomorrow. Today, in the face of growing exploitation and poverty, the proletariat must adopt the same position as the Zimmerwald Left: No to the holy alliance with the bourgeoisie in the eco­nomic war! No to sacrifices to save the national economy! Long live the class struggle! Transform the economic war into a civil war! In the face of economic catastrophe, in the face of social decomposition, in the face of the perspective of a Third imperialist World War, the historic alternative is the same today as it was in 1919: the destruction of capitalism and the installation of the worldwide dictatorship of the proletariat, or the destruction of humanity. Socialism or barbarism. The future belongs to communism.